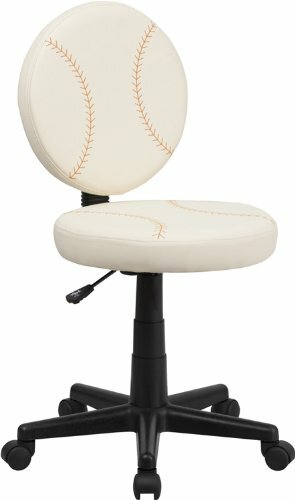 Bring your favorite sport to the desk with this Baseball Inspired Office Chair that is perfect for all young baseball fans! The round seat and back resembles two baseballs that are upholstered in vinyl material for easy cleaning. This chair was designed to support the lower-to-mid back region. Chair easily swivels 360 degrees to get the maximum use of your workspace without strain. The pneumatic adjustment lever will allow you to easily adjust the seat to your desired height. With an affordable price tag it is sure to please the young baseball fan in your home.